With the warmer weather upon us, it is time to move our sensory play outdoors! I've had this idea for a sensory bin for the past few years as I watch my girls' love of flowers and the garden grow more each year. They love helping but it can often make a mess and they just want to pick the flowers that we've planted. Like they can not stop themselves from picking the flowers in the yard. They will tell me they were already on the ground and that's why they picked them. Haha! To fix this little problem, I decided to make them their own Garden Sensory Bin that they could play with and rearrange and pick until their hearts were content. And of course, I had to throw a little academics in there with alphabet and sight word review. For our sensory bin, I opted for artificial flowers. You could absolutely plant flowers or seeds and watch them grow. I didn't want to worry about real plants being over watered or not watered enough or picked, so I decided to just use fake flowers. Assembling this sensory bin is pretty easy. Put the soil in your container and then stick your flowers in. Voila, you are done. 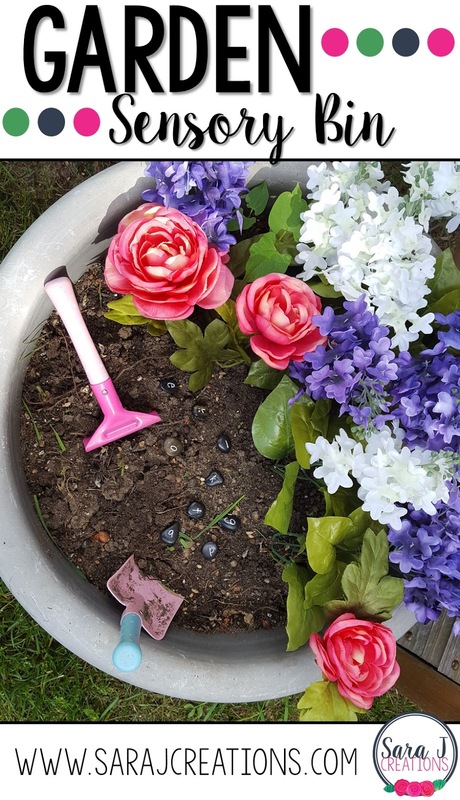 Let your little ones play and create their own garden using the gardening tools. They can pick bouquets of flowers and then plant them again. This is going to be a messy sensory bin with the soil but that's what makes it a perfect outdoor summer activity. If you want to add the ABC rocks, you can scatter them throughout the sensory bin. Then call out different letters and have your child search for them. You could also say a sound and have your child find the matching letter. To use the sight work rocks you would follow the same routine. Set them in the garden and then call out a word and have your child search for it. They could also search and find a rock and then read it. You could also combine both sets of rocks and have children select a sight word and then search for the letters to spell that word. Adding the rocks isn't necessary, but it adds a little more literacy practice to a fun activity that already focuses on imaginary play, fine motor skills and sensory play.